GCI is a custom designer and manufacturer of Material Handling, Torque, and Assembly / Material Handling Automation equipment. Located on the outskirts of Alexandria, MN. in the heart of Minnesota's lake country, GCI is well known for it's creativity and problem solving abilities. Please click on the product photo above to access the GCI Lifting Solutions website for additional product information and application quote request form. Leading the industry in design flexibility! 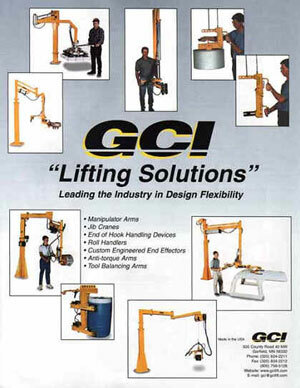 GCI manufactures the finest End Tooling, Manipulators, Torque Arms, and Assembly / Material Handling Automation equipment in the industry. We focus on creating satisfied customers by making their lives easier during all stages of the project development, and delivering and excellent piece of equipment weeks ahead of our competition. 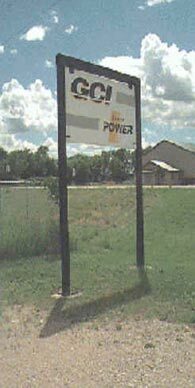 GCI began its existence in 1992 to fill a niche in the Manipulator and Torque Arm market.building first-rate machines on time! Since then, GCI has been following this mission with an incredible 80+% customer repeat rate. We provide a total program: quality equipment, a professional sales and service network, parts and training.. serving our customers throughout North America. We provide our customers with new ideas, new techniques and new technologies. We use these many facets to solve problems, as well as save time and money for our customers. Our technical know how is backed up by Degreed and Licensed Professional Engineering, Certified Welders and Expert Machinists who work together as a team to select, design, and produce custom tooling for Manipulator and Torque Arm systems specifically suited to each individual handling operation. Our designs enhance the basic goals of occupational ergonomics: "adapt the machine to fit the job / operator, don't force the person to fit the job".